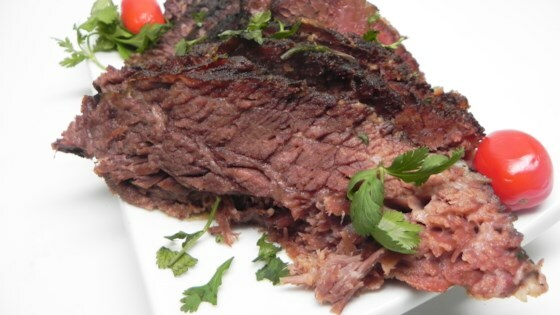 "Here is a really yummy way to cook brisket. If desired, marinate brisket with rub several hours before cooking. Serve with prepared horseradish and potatoes." Mix salt, black pepper, paprika, basil, oregano, garlic powder, and onion powder in a bowl; rub spice mixture over brisket. Arrange onion rings in the bottom of a roasting pan; lay brisket, fat-side up, atop onions. Scatter bay leaves around brisket. Pour beer over brisket. Cover roasting pan with an oven-proof lid or aluminum foil. Cook in the preheated oven for 8 hours. An instant-read thermometer should read an internal temperature of 145 degrees F (65 degrees C). Remove from oven and let rest for 1 hour before slicing. Refrigerate cooked brisket for 8 hours and skim fat that has risen to the top if desired. At this point, you can slice brisket and reheat. Outstanding! I followed the directions and it was quite the hit for Christmas Eve dinner. Thanks!